Below is feedback from students who attended SIGGRAPH 2015 in Los Angeles, California, through the Spend a Week at SIGGRAPH program. The program was sponsored by the ACM SIGGRAPH Education Committee and the ACM SIGGRAPH Computer Graphics Pioneers, with generous financial support from the National Science Foundation. I am beyond grateful that I found out about SIGGRAPH through my aunt, who was a Pioneer Mentor at SIGGRAPH last year. Attending this conference has opened my eyes to all the possibilities and career opportunities that lie within the tech world. I decided to apply to this program as I am very interested in pursuing a career in the tech world and saw this program as a perfect opportunity to learn more about the community. Before I arrived at SIGGRAPH, I expected most of the lectures and products to be less practical and more for recreation. However, I realized so many of the products can help us in our every day lives and have the possibility to impact us on both a small and large scale. Something that really surprised me was the amount of careers and paths that are in the tech world. Before SIGGRAPH, I could have never imagined all the possibilities that there are. My Pioneer Mentor was absolutely amazing. He is incredibly knowledgeable and understands youth very well as he works with them. He taught me the importance of networking and reaching out to people and explained how much this can open doors for me. I learned a tremendous amount from SIGGRAPH from attending lectures, walking through the exhibition halls, and even just talking to other attendees. Of the many talks I went to, one that I found particularly interesting was the talk on Dyslexic Talents in Computer Graphics. Furthermore, I loved attending the Production Sessions of Big Hero 6 and Tomorrowland. It was crazy to see the process by which these films were created and being able to see small details that you normally wouldn’t have noticed without receiving the inside scoop. Additionally, I was fascinated by Birds of a Feather, Healthtech: Modeling, Interaction, Hardware, and Analysis. It was interesting to see how the field of medicine is incorporated into the tech world. As someone who also takes interest in this field, I enjoyed see the role technology plays in making advances in the field of medicine. One of my favorite parts of attending SIGGRAPH was meeting new people. It was great talking to other students in the program, mentors, and other experts in different areas. Furthermore, I really enjoyed attending Birds of a Feather. I appreciated that these talks were a little bit less formal because I felt comfortable asking questions. In addition to Birds of a Feather, I also loved the Production Sessions. It was amazing to get sneak peaks of how some of my favorite films were animated. The only negative aspect of SIGGRAPH that I can think of was the schedule. Inevitably, it was difficult to create a schedule with all the lectures and interesting events occurring at the same time. In regards to my career, SIGGRAPH has made me secure in my decision that I would like to major in Computer Science. I am greatly appreciative of this opportunity because before SIGGRAPH, I was unsure of what career I wanted to pursue. I have always been more math and science oriented, and I was considering Computer Science, however this conference has alleviated the stress and angst of being unsure of which career I wanted to pursue as I am now completely positive that I want to major in Computer Science. With my new-found knowledge, I have registered on Pluralsight and plan to start learning coding. I also am looking into joining groups that specialize in one program like Python. The main advice that I would give to future students attending SIGGRAPH as part of the Pioneer Mentoring program would be to not get intimidated. Even if you have limited knowledge on Computer Graphics, don’t be afraid to sit in on any lectures that you find interesting even though you may not understand all of it. If you have any questions, don’t be shy. Everyone is super friendly and more than happy to explain things to you. Try to see as much as you can even if that means starting your day early. 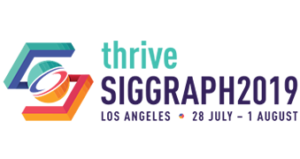 SIGGRAPH is less than a week long and it’s in your best interest to take advantage of the opportunity in order to take as much out of the conference as you possibly can. As for future mentors, I would advise them to offer as much guidance as possible. Even if it seems like you may be forcing things upon your students, you’re really not. SIGGRAPH can be really overwhelming and its nice to have someone to point us in the right direction. Don’t be afraid to make suggestions and advise students to go to specific events. When I was on the SIGGRAPH website one day, I found the Spend a Week at SIGGRAPH webpage. I am very interested in game design and computer graphics, and SIGGRAPH was the perfect opportunity to see the techniques employed by developers within the industry. I had read that there were lots of big studios like DICE and Ubisoft coming to the event, and I really wanted to attend their talks. I also was interested in connecting with people in the computer graphics industry, both because I enjoy meeting new people, and because these connections may help me in the future. I expected a long string of seminars that would cover multiple topics in computer graphics. The presenters would talk for long periods of time, using a PowerPoint presentation to illustrate their topics. I also expected the days to be long as there would be many sessions to go to. SIGGRAPH occupied a much larger portion of the convention center than I had expected. The shiny floors of the South Lobby extended far in all directions. To its front were the crowded South Halls and the massive Exhibition Hall. I was overwhelmed with LCD panels and maker sessions and loudspeakers and interesting software and other sights and sounds whenever I entered those halls. On the second floor were many dimmed conference rooms where industry specialists gave talks and demonstrations. Occasionally the presenters would break for questions, however I found it difficult to stand up to the mic and ask my questions with so many people listening. Fortunately, as the week progressed, it became easier. My Pioneer Mentor was an animation professor at the University of Victoria in Canada. At the start of the week, it was difficult to meet with him because he is also the vice president of SIGGRAPH, and was busy for most of the week. However, we eventually found time to meet, and discuss my schedule. During this meeting my mentor introduced some of his projects to me. He has developed a way to construct 3D models with an infinite amount of detail using mathematical functions. It is impossible to fully replicate these models with polygons. My mentor has created many objects with this method, including a tall tree with thick foliage. This technology is certainly the future of high detail models in both the film and game industries. My favorite parts of SIGGRAPH were the events in South Hall G, such as the Studio, the Making @ SIGGRAPH sessions, and more. These sessions were very useful and incredibly entertaining. First, I attended the technical studio courses such as Unity’s “Interactive Experience” tutorial, and the “Build Your Own Game Controller” session. Then, I checked out the Emerging Technologies venue, and gawked at the many impressive displays, especially the 3D hologram of the old man. I would have also liked to use the 3D printers that were on display in the Studio, but unfortunately I did not have enough time. My least favorite part of SIGGRAPH was the commute. My family lives in the valley and this year SIGGRAPH was held in downtown Los Angeles. We had to drive on the highway for about an hour to arrive at the convention center, and the drive was always longer on the way back. What surprised me the most about SIGGRAPH was how open to questions and feedback that the presenters were. When I first entered a talk, there were hundreds of people sitting in silence watching the presentation, and the topics being discussed were very high level. When the presenters would break for questions, few people would go to the microphones. This created an official, yet scary ambiance. However, after the talk, I went to the front of the room to meet the presenters and I was surprised that many of them were quite friendly and open to discussion. I even connected with some of them on Linked In! It was quite surprising to see the people who sounded so intellectual at the podium speak quite casually in person. SIGGRAPH has taught me of the many frontiers within the realm of computer graphics that have yet to be fully explored. Virtual Reality is one of those new frontiers, and is being incorporated into the film industry and the game industry. This is creating a lot of new jobs and opportunities. I will definitely consider pursuing a game design major after having come to SIGGRAPH. I am a hobbyist game developer, and many of the techniques in the game design courses are applicable to my projects. For example, in the Leap of Faith talk held by three rendering professionals from DICE, I learned many rendering techniques, including a clever shadow occlusion system. This system involves using a mesh to mark the outline of a shadow, and then checking if any of its vertices are within the view frustum. I will surely try out this technique in my own games. I would advise future students to plan out their day quickly and early. There are many sessions to go to, but if the student does not have a plan, she will waste time trying to pick her next class and may arrive late to it. The student should meet with her mentor early in the week so she can revise her schedule if necessary. When scheduling, it is important for the student to figure out which sessions are the most applicable to her life, and prioritize those. There are many courses that go into very high detail, but if the student is not interested in the topic, she may become bored. In addition, the student should visit the Exhibition Hall to learn about the top computer graphics companies and their products, and to take lots of free supplies. Finally, the student should make sure to visit the Studio where she can perform hands-on activities and learn how to use programs. I found this area to be the most useful part of SIGGRAPH. And throughout the week, it is important for the student to be ambitious and outgoing. She should ask lots of questions, and connect with lots of people, whether they be industry professionals or fellow attendees. These connections will make SIGGRAPH a more familiar place for the student and may help her in the future. I advise mentors to meet their students as soon as possible. Many students are bewildered by the vastness of SIGGRAPH, and have trouble putting together a schedule. If their mentors meet with them early, then they will become less confused and will have a more solid schedule. When meeting with the student, a mentor should first ask what the student is interested in majoring in, as this will ensure that the mentor can recommend a schedule that is as applicable to the student’s future work as possible. In addition, a mentor should introduce himself and discuss with the student what he is working on. This professional bonding is good because many students will appreciate having a mentor that they can ask questions about college and work in the future. My School Counselor advised me and my friend to attend the event because it is something that will benefit us both. Unfortunately, I was not able to make it that year as I had to take a trip down to Mexico to see my grandfather. I wanted to apply but couldn’t and knew that the next time SIGGRAPH came to Los Angeles, I would go. I applied this year because I heard so much about it from my friend and also because everything that the event had to do with, interested me. I knew that this event was going to blow my mind because of the new, cutting edge technologies that were being presented and SIGGRAPH did not disappoint. I was amazed by every session I went to and was even more excited about the “Emerging Technologies” part of the event. My mentor for the week was there to help me every step of the way. He helped me map out a schedule of what I might like to do, but gave me the liberty to explore on my own. I had the opportunity to go with him to the Emerging Technologies section and he was able to explain to me, absolutely everything that I did not fully comprehend. Thanks to my mentor, I was able to expose myself to things that I would have never even considered learning about. I was able to sit in on multiple Technical Papers, Birds of a Feather, and even sessions that explained how movies like Jurassic World or Inside Out were made. The overall experience was unlike any other, something that I surely would not see any where else. My favorite part of SIGGRAPH was the Emerging Technologies section because of all the new and exciting technology that was being displayed. The least favorite part of the event for me was the I was not able to see everything that I wanted to. Multiple times there were sessions occurring at once that I wanted to see and I had to make a decision on which one to go see. What surprised me the most about the event was the liberty that was given to the students. Aside from one or two courses that were mandatory, we had to opportunity to truly explore our interests. I thought that the entire week was going to be mapped out with technical papers and courses to go to, but it was the compete opposite. I had the liberty to go to anything that I wanted, which made the experience more enjoyable. SIGGRAPH has opened my eyes to a variety of professions. Being able to experience the event, I now want to take multiple courses in college to explore a bit more about things such as computer animation, computer science, and even business and finance. Every day that I came back home from SIGGRAPH, I told my brothers and parents about what I had learned that day. I used this knowledge that I learned to both teach my siblings and develop new ideas about what I want to study and eventually do with my life. To future students attending SIGGRAPH as the part of the Mentoring Program, I would say make the most of the experience. I don’t just mean try and make the most out of attending the event but also get to know your mentor and establish a good relationship. Who knows – maybe one day your mentor could introduce you to your future employer. Make the most of the event and have fun. To the mentors I have nothing to say but, thank you. My mentor couldn’t have been better and I can not thank him enough. Thank you to my mentor, and thank you to my school guidance counselor for introducing me to SIGGRAPH. I learned a lot of stuff that’ll help me in the career path I want to pursue. I heard of SIGGRAPH through my teacher at school – she gave me the information about attending SIGGRAPH through OTIS. My teacher was also the one who helped me write my essay/application to be able to attend SIGGRAPH. The main reason that my teacher gave me the information was because she saw me trying to learn “C++” once during class and she thought I would benefit from attending the conferences at SIGGRAPH. The reason I decided to apply was because I am very interested in following a career in the Games industry, but I’m not really sure what exactly in that field I would pursue. I also didn’t have any classes to learn from and it’s a bit difficult trying to self-teach myself certain things, so when my teacher gave me the information about attending SIGGRAPH I immediately began to apply because I now had something to learn from and get some experience from. Before I attended SIGGRAPH I expected it to just be a huge convention/conference showing off new technology. Granted there were parts where they showed off some new technologies, I wasn’t expecting there to be things like hands on courses to learn from. I also wasn’t expecting there to be panels from industry veterans, or talks with in depth looks on how certain films and games were made. My idea of SIGGRAPH was totally different then what it actually was. Even though SIGGRAPH wasn’t what I expected it to be, I still had a great time and gained some great experience from attending. Throughout the conference I only had time to meet my Pioneer Mentor once, but I learned quite a bit from her through that one day meet up. She works in Computer graphics and has worked on films as well as games. Her current research has to do with real time rendering, can’t quite remember the exact details she told me, but it really peaked my interest as she told me about it. I had told my mentor that I want to be in the games industry but that I wasn’t quite sure if I should pursue being a programmer or being a computer graphics artist, and from her I learned that I could potentially do both through being involved in making shaders. My mentor also mentioned events called GameJams after I told her I am familiar with using Unity. She gave me the website and some info about what exactly GameJams are, it’s essentially when a group of random people get selected to go against another team of randomized people who have certain rules and the teams are given 48 hours to make a game demo. Even though I didn’t talk and interact with my mentor much, the time we did meet and talk I learned a lot from her and I’m glad she ended up being my mentor. While attending SIGGRAPH I saw, heard, and experienced many amazing and great things. Most of what I saw and heard was confusing to me because it was all advanced but I like learning new things so I did my best to understand and learn from what was said and what I head at SIGGRAPH. Most of the things I ended up seeing had to due with game development and game design because that was those talks and courses interested me the most. One of the best things I experienced at SIGGRAPH was being able to learn techniques and programs used by veterans of the Games Industry. My favorite part of SIGGRAPH has to be all the Games focus courses, talks, panels, etc. It’s hard to decide on a favorite thing, but I do have to things that I really enjoyed at SIGGRAPH. The first thing has to be the Computer Animation Festival; I had such a great time looking at various animations that were made for films, games, or just by students. My second favorite part of attending SIGGRAPH were the courses, mainly the course where I got to play around and make a small game demo in Unity 5. That course really benefited because now I know a bit more on how to use Unity and I will continue learning how to use it through practice and experimentation within Unity 5. My least favorite part of SIGGRAPH for me was the lack of at least a couple or one beginner courses. I understand that SIGGRAPH is mainly meant to be attended by people within the Industry but having at least one basic course would’ve been beneficial. Another thing I didn’t really like about SIGGRAPH was that sometimes the talks, courses, or panels would go overtime and cause me to miss parts of other things I wanted to attend. I can understand that sometimes things go over the expected time but it would’ve been better if things were punctual. Other than that SIGGRAPH was overall great. Going to SIGGRAPH has only encouraged me more to work hard to achieving a career in the Games Industry. Seeing all the creative process of how a game is made really convinced me that it’s a career path I want to take. While I attended the Unity course, just making a small simple game demo and seeing it run made me spark up with joy because although it was a very simple demo I had learned how to make something I’m passionate about. SIGGRAPH really helped me decide that the Games Industry is a career path I want to work hard towards. I have learned a lot of things over the week attending SIGGRAPH. I will continue to add knowledge to the things I learned while at SIGGRAPH. I also have a couple of friends who want to be involved in the Games Industry but are kind of unsure of what is expected, I will pass on the knowledge I gained onto to others. One of the things I for sure am going to keep working on is trying to use Unity 5 more and more to be able to one day make a full working game demo, if not to sell then just for me to have at least something that shows my progress. For future students attending SIGGRAPH with the Pioneer Mentoring program the advice I can give them is, don’t just attend but learn from attending SIGGRAPH. There are many showings for all types of careers within computer graphics, just make sure to take a look at a bit of everything. Don’t just limit yourself to certain career focuses, explore and check out talks and courses with other careers because although I was focused on the Games Industry I attended other career path talks and they were just as interesting and I learned many things from those too. Explore and learn and make experiences you can take with you after. Advice I would give to future mentors would simply be to educate their student. Give them things they can learn from and take home with them. Make sure that the students experience is a good one and not a waste of time. I was very happy with my mentor and I hope future mentors are as great as mine was. Overall I had a great experience and attending SIGGRAPH really gave me that push I needed to follow my career path. Thanks to the Pioneer Mentoring program, I now have a career path set. It’s an opportunity-filled land where you get the chance to meet so many people from all around the world, all while learning new things and teach them.This was my first time ever attending this event or any event of this kind and it was even my first time hearing of it. Once my technology teacher sent me an email regarding SIGGRAPH and the Pioneer Mentoring program, I knew I had to apply. I’m always open to learn so when I opened up SIGGRAPH’s website I was amazed but nothing like the moment of when I first arrived. I was so surprised it took my breathe away. There was so many interesting things to do and so many people to meet. I remember I kept telling my friend that there were so many things to do but so little time and how I wish it was even longer. I was fortunately able to do a lot of things. I got to tinker with so many new technologies. Such as virtual reality, new indie games and cool gadgets that focus of the future of education. I got the chance to play Lumino City, a PC game that used a real photography and model, I was able to be interactive with a virtual reality car crash simulation and so much more. I also had the opportunity to speak to most of the people who made the things come true.The amount of passion they had made me so excited that it even inspired me to one day be able to be apart of SIGGRAPH as a creator myself. The future is now and it is blossoming like never before. There was also panels, talks, and I even got the chance to attend the Computer Animation Festival. I attended the Disney panels and production sessions. I learned from Disney animators themselves a lot such as what are some of the best ways to apply for disney or any other company. One of my favorites was Woman in animation and as well as Women in CG. I feel as this gave me the push I needed. It helped me feel more secure about myself and what I want in my career for this field. It was very empowering overall. What surprised me the most was the Computer Animation Festival. The people I met would constantly tell me to make sure I go but it was nothing like I had imagine. The amount of work people put into these amazing award winning videos was astonishing. Its amazing how just an idea or concept can grow into something real and beautiful. I had the lovely chance to have a mentor throughout this experience. My mentor was amazing. Although we didn’t get the chance to hang out as much as I would have liked due to all the great panels going on I did learn a lot. She told me how to research for colleges that have great animation departments. She, herself works at SCAD, an art school which is also great. The Pioneer Mentoring Program is fantastic, I suggest the mentors be more open with their mentees to show them that they are here to guide them and help out like a older family member. I believe future students should attend in order to be inspired. If the student wants to attend they should come with the idea of learning while having fun as well as having an open mind and they will enjoy this experience. Being able to come to an International event and communicate with amazing people can help you broaden your horizons educationally and personally.SIGGRAPH helped me gain so much and I was able to understand what career I wanted and what will be required of me in order to get that dream. I’ve never been quite clear in how to do that but SIGGRAPH really helped me in giving me a head start in life. The speakers inspired me to pursue a career in technology and gave me plenty advice. This experience impacted my life and it will can do the same for so many students. With this brand new experience and all my knowledge of it. I really hope to inspire others the way these amazing people have done to me. No matter what I will keep on advancing right along side with technology. Always wanting to learn. The technology of tomorrow starts today. I originally found out about SIGGRAPH through my technology teacher in high school. He knew about my interests in technological advancements, engineering, and programming and that led him to invite me to look into the program. Although I was excited about the opportunity to attend since the moment I learned about it, after I researched the conference I knew it wasn’t something I could miss. SIGGRAPH was able to give me many surprises this year. I did not expect so much interaction with other people attending the event. I expected to go on about my business attending the conferences alone and on my own will. I found myself not only attending conferences with friends but also finding myself in a few social gatherings. The amount of people I socialized definitely surpassed my expectations. My mentor taught me many things. His method of teaching was very random and full of comic pauses and that made things a lot more enjoyable to learn. It almost seemed like her knew a little something about everything. I was lucky to have a mentor who not only cared about my interests but also did what he could so that I could meet people in fields related to my interests. From his explanation of the Pixar Teapot to the ESRI software, he seemed very knowledgeable and enthusiastic throughout. I am proud to say that I had a little taste of everything when it came to presentations to attend. I was in Talks a lot less than I expected but I surprised myself by attending a Birds of a Feather. I particularly enjoyed sitting in on a few Production Sessions, which have always been a great interest. Although I didn’t so much enjoy a few of the Talks I began to attend, SIGGRAPH always provided me with something else that I would later enjoy. SIGGRAPH has affected my perspective in many things. In the world that I am used to, professionals are seen as foreign, boring outsiders and I had the opportunity to learn that it isn’t really that way. I feel lot more comfortable in what it will be when I try and make a career out of my current interests. Programming has always been one of my main interests but SIGGRAPH has motivated me to look into the mobile applications side of it. I learned the basics of it but with the help of an individual I met at the conference, I hope to become fluent in the subject. I also plan to look into Mathmatica once I attend college, now that I know what is going on behind the scenes. I would advise future mentees to not be afraid to be outside of their comfort zone. There is going to be a lot of unfamiliar things but they should see this as a learning experience more than anything. Secondly, they should see this as a networking opportunity. I wouldn’t know what to advise mentors because I feel as they already go above and beyond what is asked. A couple weeks before SIGGRAPH, I was attending a program at Google for rising college freshmen. I mentioned to one of the TAs that I was interested in pursuing computer science, but wasn’t sure which direction to take within the field. He suggested that I attend SIGGRAPH, where I could learn more about the area of computer graphics. Upon his suggestion, I applied to SIGGRAPH’s Pioneers Mentoring Program. I had never heard of SIGGRAPH before, so I didn’t quite know what to expect. I thought there would be a strong emphasis on computer science and the process of animation from an engineering angle. However, I discovered that SIGGRAPH covers the more artistic aspects of computer graphics. The panels mostly consisted of artists, and the lectures that I attended very rarely covered the technical aspects of computer graphics. I would have liked to hear more about the computer science aspect of computer graphics. How do the simulations work? What was the process of designing the software? How do the artists and engineers work together? My favorite parts of SIGGRAPH were the production sessions. I especially enjoyed the Inside Out production session where the character artist explained how he based each of the “emotion” characters on an basic symbolic shape. Joy was represented by a star, Anger by a square, and so on. It was interesting to learn about the detailed process of designing vibrant relatable characters. Attending SIGGRAPH has shown me that the field of computer graphics is a collaboration between artists and engineers, rather than artistic engineers or computer-savvy artists. Knowing this, I would still have to do more research before deciding whether or not to pursue a career in computer graphics. My focus is on computer science, but I want to combine that with something creative I don’t know if that something is computer graphics. I was very lucky to have the mentor I did. After asking about my interests, she suggested some events throughout the conference for me to attend. She gave me advice on pursuing different areas within computer science and graphics, and had a lot of insight to offer on day-to-day life in many different career paths. I learned a lot at SIGGRAPH. I’d like to learn more about the programs mentioned by conference attendees and presenters. It would be great if I could learn how to create simple graphics and animations for websites. I would tell future attendees to look over the schedule and create an agenda a couple days before the program starts. I would suggest that the mentors communicate with the students beforehand and help them with this process. I hadn’t looked at the schedule before my first day, and it was a bit overwhelming to be presented with so many overlapping events. My week at SIGGRAPH was incredible. Thank you to everyone who makes the Pioneers Mentoring Program possible. You get to meet so many people, explore your interests and learn new things. My technology teacher first mentioned SIGGRAPH to me. At first, I didn’t know what to think. I was skeptical about applying noticing that it would be on the last week of summer vacation but in the end, I was motivated by a good friend of mine. When I arrived, I was surprised at how large of an event it is. There were people from Oregon all the way to Brazil. So many interesting individuals who are striving for a successful career. I was able to dabble around with technology like virtual reality and go back in time. I understood the view of a child just by wearing a simple suit. There was so much to view and so much to learn about. I had the chance to speak to the creators of these magnificent devices allowing for me to receive a more in depth view. The feeling of being able to do something amazing from just an idea was astonishing. The future is in our hands and every day we are advancing. Technology wasn’t the only main event, I got to listen in on panels and talks. I got the chance to hear how Disney animators work and how you can create your own video game world. Panels included in SIGGRAPH helped me gain knowledge and understand what career I wanted and what I needed to have in that career. I’ve always been confused but now I have a general idea, which is really helpful in leading my road in life. The speakers were really inspirational and gave tons of helpful tips. This experience changed my perspective on my own life and it will continue to change it. I believe future students should attend as part of the Pioneer Mentoring program in order to be inspired. There is so much creativity and you get to connect with a mentor. You have the opportunity to talk to someone who has had way more experience and shows you the ropes on life. My advice is to keep an open mind, to keep positive and be ready to fill your mind. In the future, I’d like for mentors to to be more comfortable and relaxed. I didn’t get to talk to my mentor much but I talked to others. Having connections will really get you far in life and this program does just that. With what I have learned, I hope to inspire others as well. To share my experience and go beyond. I will keep growing and learning. I loved everything about SIGGRAPH. It marked a new shift in my life and I hope that others will also be able to experience SIGGRAPH. Although I do not plan to be a computer graphics major, I have heard only good things from my brother about the convention and decided that there was no harm in applying (with not much else to do with my summer) and that I could only gain from the convention and learn more about the technology and innovations of today. I love learning new things and SIGGRAPH was just one of my outlets for doing so. To be honest, I did not expect much. As an aspiring medical student with little interest in computer graphics in technology, I figured I would just find out how my Pixar movies are made. I learned so much more from the convention though, being able to apply the technology seen at SIGGRAPH to medical imaging, simulations, and so much more. My mentor was honestly one of the best mentors I could ever have for SIGGRAPH and I learned so much from him. An already well-connected person, he described to me his career in animation, already teaching at Iowa at 16 and how he applied animation to his career today, from helping animate characters for Disney to using Maya to design buildings as a mechanical engineer today. Having also been to SIGGRAPH 28 times, he already knew all the exhibitions and helped me organize my schedule in that week very efficiently so that I could get the most out of SIGGRAPH and learn the most I could. At the Computer Graphics festival, I learned so much about animation and how things are actually animated. I have always wondered how movies with so many effects and props could be directed, like in The Hobbit or in Jurrasic World, and SIGGRAPH made me realize that almost EVERYTHING was animated. I saw how important animation was in every aspect of our daily lives, from developing a better imaging technology for the human heart to virtual reality that would be the foundation to the future entertainment industry. SIGGRAPH opened me up to so many new possibilities through animation and inspired me to learn about computer graphics so much more. My favorite part of SIGGRAPH was being able to converse and meet with so many different people of all backgrounds and gain a better understanding of the world around me. I must have taken over 20 business cards and somehow talked to people of a variety of languages and accents, all coming together for computer graphics. And in each person, not only did I learn how graphics had effected each of those people in their lives and careers, but I also made many new connections and networking webs while having a great time overall. My least favorite part of SIGGRAPH was the food. Although the food was very good and filled you up enough for the full day, it was extremely expensive and I only had enough food vouchers to last me one lunch a day. Two meals costed more than 15 dollars, and it was hard to get by with only one meal a day to save the food vouchers while the line was about 20-30 minutes anyways. What surprised me most was the fact that computer graphics had so many different applications in so many different fields that it opened up my mind to the wonders of computer graphics. Coming into SIGGRAPH, all I expected was how your entertainment industry animated characters, but I realized that it is used in engineering, entertainment, medical imaging, website design, simulations, and so much more. As a medical student, I never really saw much use to knowing animation or computer graphics, but I realize now through SIGGRAPH that it has EVERYTHING to do with the medical field. The major innovations today are through how to simulate processes and functions of the human body that cannot be done in real life.Technology is the main driver of medical advancement today, and through graphics programs like Maya I can utilize techonology in my field; the human heart model shown in the computer graphics festival is just one example to how useful animation can be. Applying for major colleges and universities, I am considering majoring in biomedical engineering using the knowledge I learned at SIGGRAPH because what I have seen really sparked an interest in me which I would like to pursue even more down the road of my education and my career. To all the incoming mentees: TRUST YOUR MENTOR. Do not be afraid to ask many questions and do not be afraid to tell him or her your thoughts. Your mentor is extremely knowledgable and can open doors to you in SIGGRAPH that most of the attendees do not even know about. They have the experience and the ability to make SIGGRAPH the best experience you’ve ever had. To the mentors – letting your mentees explore most things for themselves is a great thing. Not letting them run off, but providing them the opportunity to attend different sessions, explaining them through your knowledge and giving advice, and letting them decide for themselves. I made so many connections only because my mentor was willing to introduce me to them, but after gaining the momentum I got to learn so much more.